"Background process is running: Exit Aborted"
Wife: "Steve, can you install an exhaust fan in the small bathroom?" Steve: "Sure, hunny, no problem. I just ordered the fan and I'll call Sam to install it." Customer: "Can you add this simple little feature to our application?" Developer: "Sure, no problem. I'll get right on that." Sam: "Steve, I cut a hole in the bathroom ceiling for the fan, but something is strange. 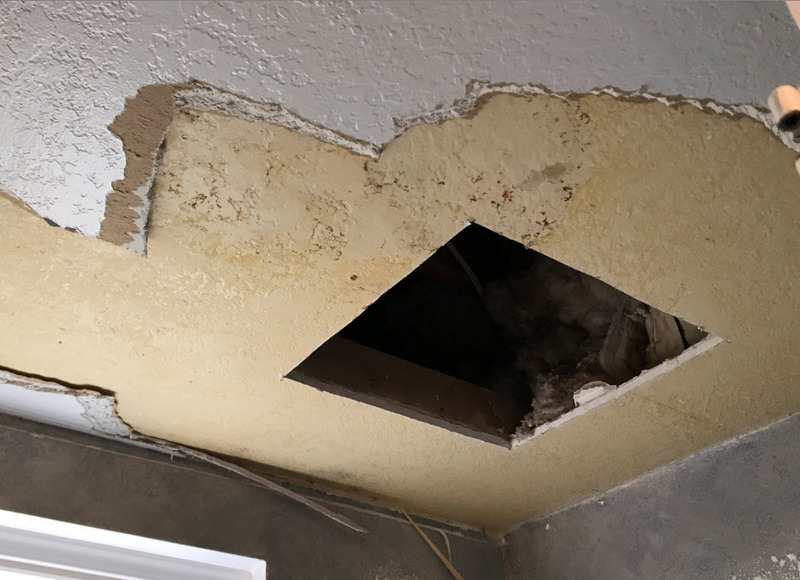 There's an extra layer of drywall on the ceiling, and it's not attached properly and it's sagging." Steve: "Hmmm, that doesn't look right. Let's remove the extra drywall and see what the prior homeowner was covering up." Customer: "So how's that new simple little feature coming along?" Developer: "Well, I looked through the code, and the original developers didn't design the software to handle this feature, so it's going to require some redesign of the customization." I think the project scope just changed. Tonight I'm testing some changes to a GP VS Tools AddIn that I developed. I apparently had a bug in a line of the AddIn code that caused GP to crash while I was editing a Payables Invoice. So I fixed the bug, recompiled, and opened GP again, clearing out my old login record. 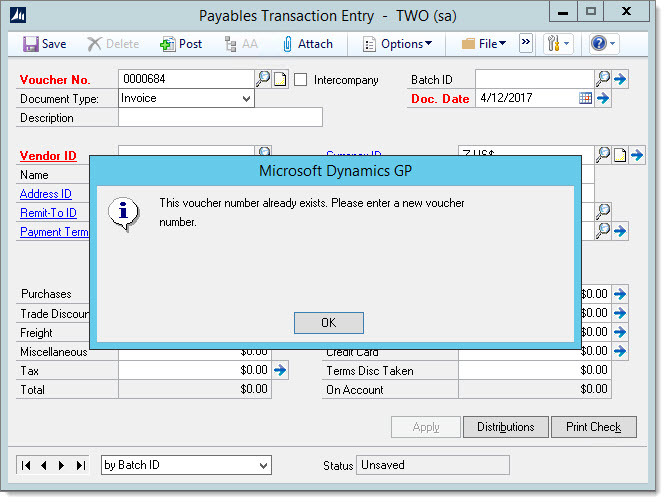 Strangely, when I opened the Payables Transaction Entry window and clicked on the 'last' record button, nothing happened. Using the First/Previous/Next/Last buttons wasn't bringing up my test invoice. Odd. 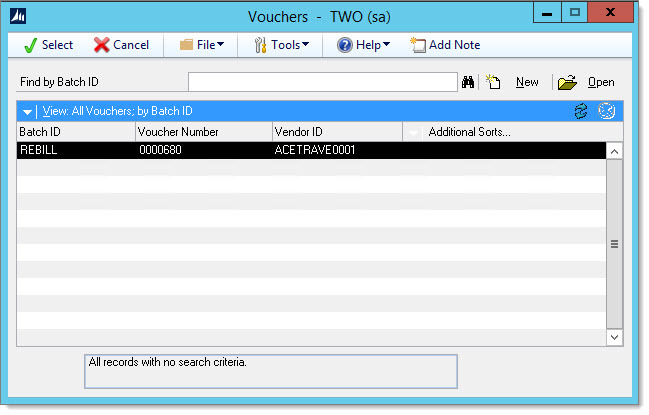 I then tried the lookup button next to the voucher number field. There was the invoice. Hmmm. But when I tried to select the invoice to open it, I received this message. Um, ya, of course the voucher number already exists! It's a saved voucher! So apparently the GP crash caused some problem that is preventing GP from opening the voucher. They also saw this message in Event Viewer, which helped narrow down the cause. 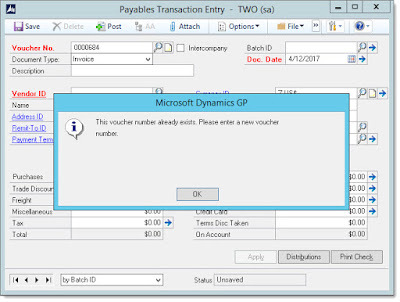 Recent versions of Dynamics GP have included terrific enhancements to 1099 tracking. 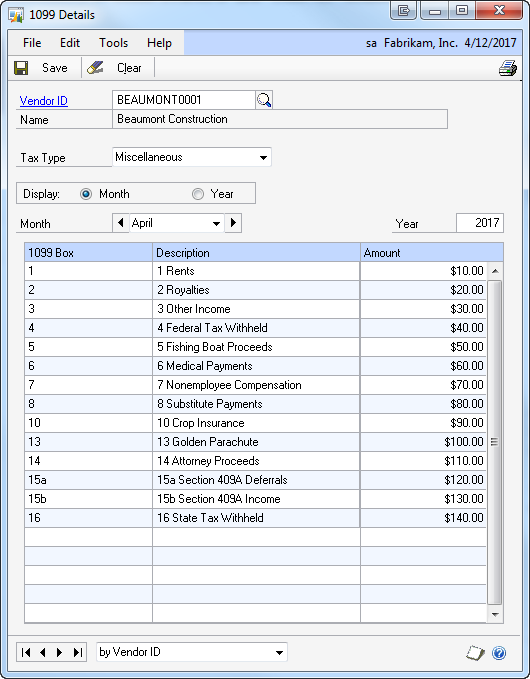 The ability to track 1099 amounts per type and box at a transaction level allows users to track in greater detail without having to assume that all of a vendor's payments go to the same 1099 type and box number. Along with these enhancements, though, there are not a lot of great reporting capabilities to review this information by type and box. Of course, you can inquire on the information easily (Inquiry--Purchasing--Vendor 1099 Details, Cards--Purchasing--1099 Details). 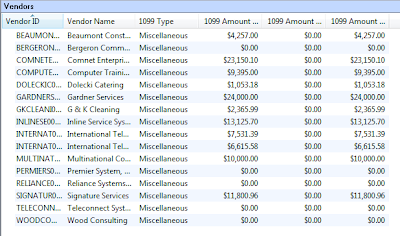 The issue with these windows is that you have to review the 1099 information vendor by vendor. This is normally fine if you have a small amount of 1099 vendors. But for those users who have 100, 200, or even 500 1099 vendors, a report or export is much easier to use. However, if we look at the 1099 fields available directly in SmartList, we will see that they are the "Amounts Since Last Close" summary fields. 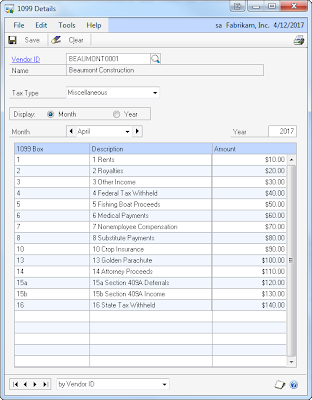 Which means that they are not date sensitive (they would be based on the last time you closed the calendar year for Purchasing), and they also do not include amounts by 1099 type and 1099 box although you can display the vendor's default 1099 type. So, this may work okay if a vendor uses only one type and one box, and you are confident that you closed the Purchasing module on time for the prior calendar year and did not post back to the prior year or forward to the new year. So, what about reporting? Yes, you can print a report from Cards--Purchasing--1099 Details, but is only available for one vendor at a time. 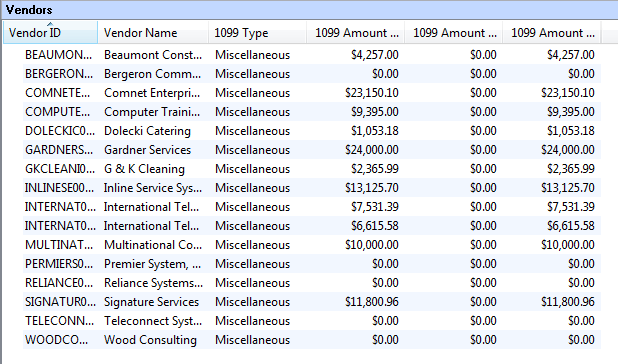 In the past, I would tell users to print the 1099 edit list from Routines--Purchasing--Print 1099. Dynamics World has once again prepared a list of candidates for The Top 100 Most Influential People in Microsoft Dynamics. If you use SQL Server Management Studio, I've assembled a few helpful tips that can help you save time and work more efficiently. Here's a video where I discuss and demonstrate the tips. 1. 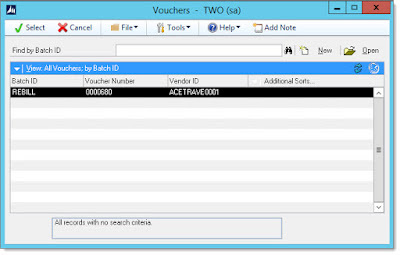 By far the most valuable time saving tip is to use the Object Explorer Details window in SSMS. I have had hundreds of GoToMeeting sessions with customers and consultants who only used the Object Explorer pane and weren't familiar with the benefits of the Object Explorer Details window. If you are using the Object Explorer pane to locate tables or stored procedures, press F7 to open the Details window and save yourself a ton of time. 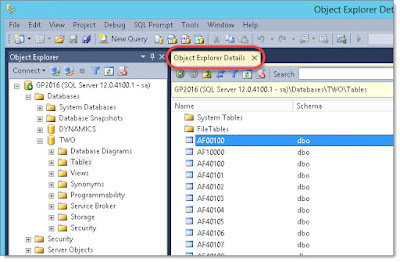 Check out the video to see how to quickly navigate and search using Object Explorer Details.